No worries. Tehilla thought of a great way to keep us busy around the clock. Thursday evening she started with a slight cough that very quickly turned into a viral upper respiratory infection. She also hurt her eye when something flew into it and she rubbed it incessantly. So Friday morning we were at our doctor. She received drops for her eye and she was checked thoroughly because of her cough. But it was nothing more than a cough. All of Shabbat her cough got worse and she developed a fever. I started her on Mucolit and saline inhalation to loosen the mucus she was choking on. I monitored her oxygen saturation which was 82-91 (amazing for her!). She seemed to improve. Our doctor made a house call tonight to check on her. Her chest sounds clear and her oxygen levels are great. He is concerned because she has had coughs off and on for over a month. He is sending us for a blood test in the morning and then depending on the results, a chest x-ray as well to rule out pneumonia. So...we are keeping it busy around here. 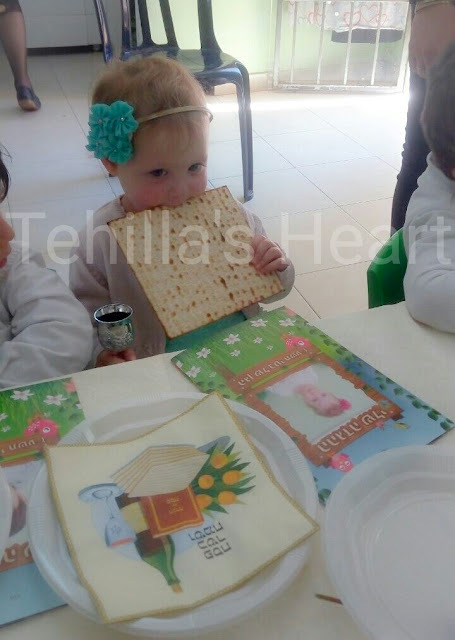 Here is a picture from Tehilla's school Pesach party. She is so very precious. So precious.